- same as above but concerning the exoplanet detection's techniques (scaled up, otherwise we will see just a flat line). Good idea to set up and discuss wishlists at this time. We are still flexible enough to implement certain wishes that fit into the general .Sci framework! FFT for pulsar audio and visualization of certain exoplanet detection techniques sound like very good suggestions. Yet for exoplanet detection, micro-lensing is an important tool as well. Dawoon's (aka DW) lensing implementation is currently making good progress. He has already agreed to write a little report here about the background, the motivation and the status of the lensing project in .Sci very soon. Stay tuned. a red outline theme ? My guess is the necessity or not of a "night vision" UI greatly depend on how people use the soft. I'm pretty sure many astronomers don't even look anymore to the sky when it's time to set up a computer assisted telescope, specially if one is looking for some DSO's or other very dim objects... For such use, of course such feature is useless. We may also consider .Sci will still be a good soft for the basics, so amateur astronomers could be tempted to use it outside as a sky map. For them a dim UI would be certainly welcome. Anyway, the topic being VERY low priority, the discussion is opened but no concrete result on this side should be expected for the near future. Chris' writing may lead to the impression that we are still in the planning stage of the GUI of .Sci. But actually we have already spent many weeks in the design and coding of .Sci's new UI in the beginning of 2013! While the new GUI may not yet be final, it doesn't need much more development for now, except perhaps some polishing here and there. 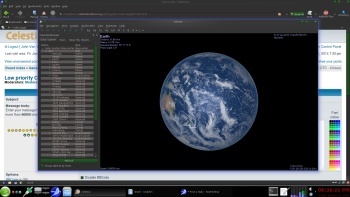 It is quite clear that we will spent any free resources now to a further implementation of new astrophysical and cosmological visualization functionality, rather than to GUI polishing or even night vision. A night vision UI must have some good functional use, otherwise it wouldn't be worth the considerable development time it will cost! I think a night view mode is just useful. Imagine you are outside enjoying the beautiful sky, when you are going to launch Celestia, suddenly, a flash come out... That must be terrible. I am afraid that he cannot see the milkyway any longer. I read an interesting research report some days ago. It said, dim red light can keep those who stay up calm, while a bright light or a blue dim one at night may drive one mad! One little question: How much of the relativity effects will be considered in .Sci? While I am not a fan of a "night view" mode, relativistic effects are definitely planned. Firstly, a General Relativity (GR) framework is obligatory for a sensible simulation of cosmological effects! Effects due to Special Relativity (SR) can and should be implemented, too. However, there are some conceptional problems to be solved first: for consistency, in SR all speeds are bounded above by the finite speed of light (c). Giving c its measured value, it would take a long long time before we could reach a system beyond our solar system in celestia.Sci simulations . Hence we need to think about suitable "tricks" to circumvent this issue in simulations. However, there are some conceptional problems to be solved first: for consistency, in SR all speeds are bounded above by the finite speed of light (c). Giving c its measured value, it would take a long long time before we could reach a system beyond our solar system in celestia.Sci simulations . Hence we need to think about suitable "tricks" to circumvent this issue in simulations. A long time ago, I already described why the current implementation of Celestia (observer apparently moving at v > c) isn't in conflict with relativity theory : the observer is never moving at all, relative to the globaly cosmic frame (the one in which the CMB is locally isotropic) ! All the observer could do is "jump" from one position to another one, in a continuously way. His apparent motion is virtual. The global frame of Celestia is defined by an infinite number of static observers, each one at rest relative to the next one. When the user starts "moving" in space (whatever the velocity), he's just switching from one static observer to the next. Again, this is just a virtual motion, and can be done at any rate (i.e. any "velocity"). There is NO conflict with special relativity theory here. There is NO conflict with special relativity theory here. Generally, what you were describing above for v > c , is well-known as a Tachion scenario. Tachions themselves are indeed NOT inconsistent with Special Relativity. The big problem arises however, with Causality, when the Tachionic particles ( v > c) are allowed to penetrate the light cone, thereby interacting with normal particles that travel with v<= c! For celestia.Sci the SR challenge will be considerably bigger than it used to be for Celestia: we want to implement in 3D graphics all the characteristic observable effects of SR that critically depend on the ratio v/c being <= 1. For a summary and nice, instructive videos, see once more this site http://www.spacetimetravel.org/. Yep. I often get confused when I see the Celestia's camera is running in a faster-than-light way. That's impossible in reality. The relitivity work of .Sci is awesome! This reminds me of another space simulation program called Space Engine which shows the camera speed... It sometimes reach a speed up to thousands even millions of c! No, it IS possible ! Read again my explication above.